How effective is your cooling system? If one of your air conditioning units (ACU) fails, which part of your data center will be most affected? Will your IT overheat before you can make the necessary repairs? Knowing the impact of ACU failure is essential to ensuring your IT’s safety and, in turn, your data center’s continued performance. The 6SigmaRoom Zone of Influences tool is used by designers and engineers to gain insight into where air is flowing from and to in the data center. For instance, this tool can determine which ACU(s) are supplying a given cabinet with air or which cabinets are being supplied by a given ACU. Being able to do so makes troubleshooting airflow problems, assessing the impact of infrastructure changes or ACU failure easy and efficient. Using the industry’s leading data center CFD simulation software, this tool makes high-density DC design straightforward. 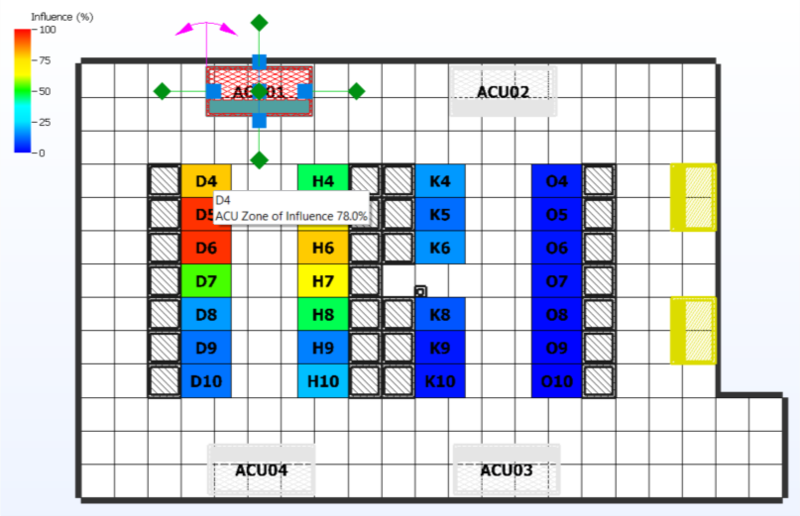 The Analyze Zones of Influence tool calculates the volume of airflow exchanged between each ACU and the IT in each Cabinet. 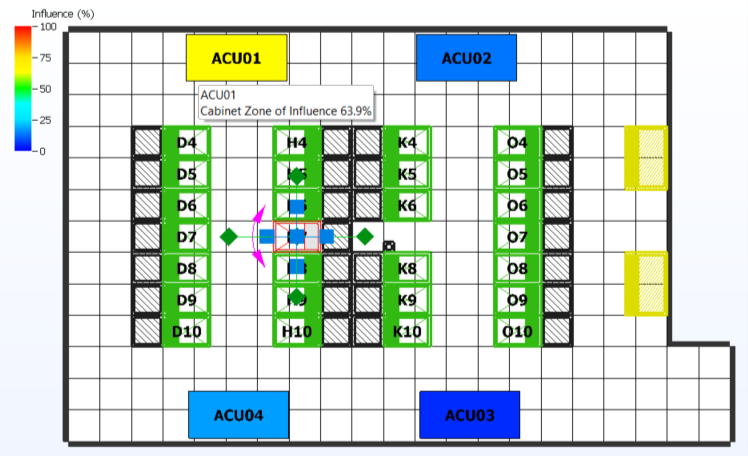 Plotting the ACU Zone of Influence will show the ‘influence’ of the selected ACU(s) on each cabinet. ‘Influence’ means the proportion of the airflow supplied by the selected ACU to each cabinet in the room. Similarly, the Cabinet Zone of Influence will show the ‘influence’ of each ACU on the selected cabinet. Here, ‘influence’ means the proportion of the airflow delivered to the selected cabinet by each ACU in the room. The results of these analyses can be exported – see our Help Guide for Export Calculated Values for more details on exportation. To use the Zones of Influence tool, you should first have a digital twin of your data center. From here, click the “Zones of Influence” button under the “Solve” ribbon. Set “Type” to “Air Cooling Unit” if it is not already. Under the “Source ACUs”, select and attach all ACU(s), then click “Apply” and “OK”. The tool will then calculate the ACU Zones of Influence. Similarly, by selecting “Cabinet” in the “Zone of Influence” analysis box, you can plot the proportion of airflow delivered by each ACU to a given cabinet. Here you can see that cabinet H7 is receiving 63.9% of its air from ACU01. The Zone of Influence tool makes it possible to determine how effective your data center’s cooling system is at the current moment, as well as how effective it can be in the future. If you would like to read more tooltips regarding data center airflow management, consider reading: Designing High-Density Data Centers in 6SigmaRoom and/or Control Systems & Virtual Experiments.